Hello and welcome back to The Bluebirds Nest. Today I’m fixin to learn ya how to make some bean soup! When I was at Walmart the other day, I stumbled upon this little package of dried beans with a recipe on the back of it. I was intrigued and for the $2.38 price tag, I decided to explore the possibilities. The multi-colored beans were just so cute! Let’s see, we have varieties like northern beans, pinto, lima, garbanzo, split peas, kidney, pink beans, lentils, navy beans, black beans and many more. WARNING: The Bluebirds Nest is not responsible for any side effects caused by consumption, including but not limited to… um…. noxious fumes…. Thank you. Before you do anything, you need to have soaked your beans at leat 8 hours or overnight in 2 quarts of water. When you drain the beans, they will be much more crisp than any canned bean. Don’t be alarmed. They will totally soften up by the time the soup is done. Now, if you read the package recipe you will notice that I only loosely follow it. 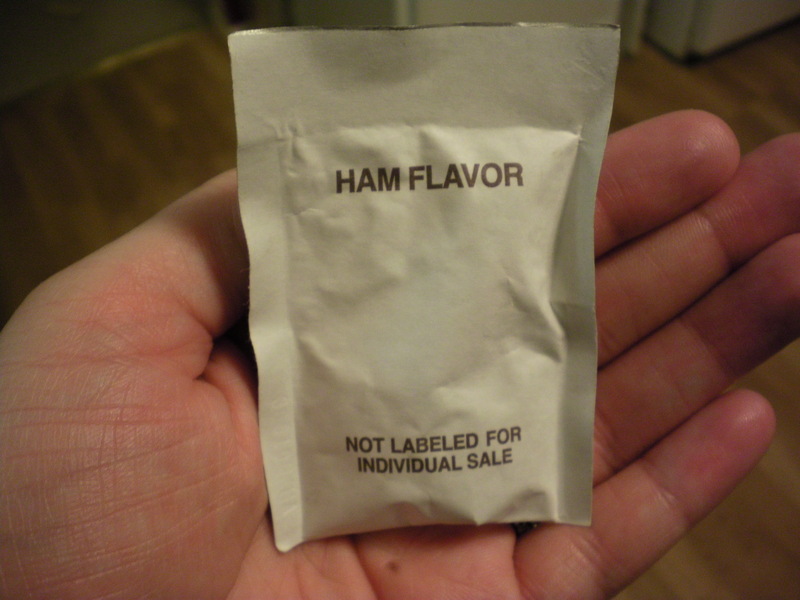 For example, the beans come with a “ham flavor packet” that includes ingredients that I cannot pronounce. A good rule of thumb is “If I can’t say it, I’m not eating it”. I decided that I could put just as much natural flavor in this bad boy without the chemistry homework….hence the bacon. Begin by cutting the bacon into small pieces. Use your kitchen scissors to do this because trying to use a knife is so annoying. Ever been there? Makes you so mad you could just spit. Spitting + Cooking = Fail. In a large dutch oven, heat enough olive oil to thinly coat the bottom and once it’s hot, add the bacon and cook until it’s all crisped up and happy. 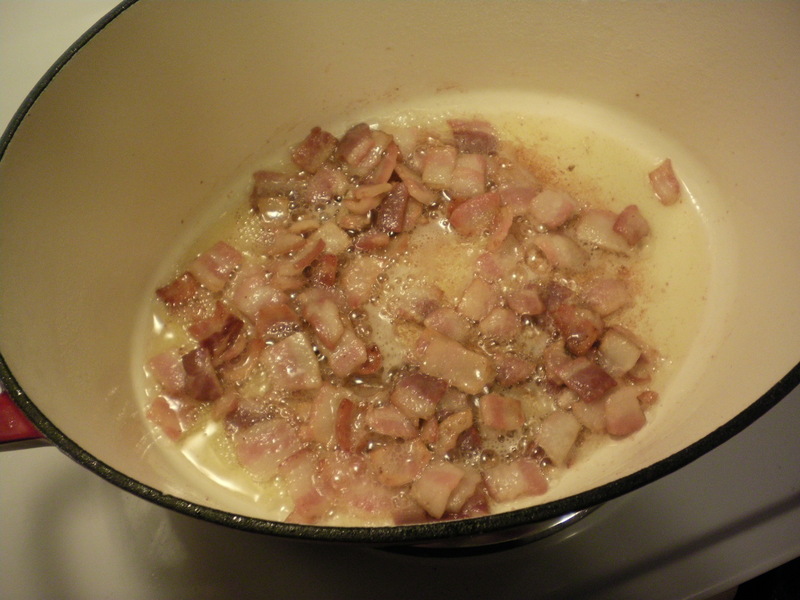 When the bacon has rendered all its fat, take it out of the pot with a slotted spoon and let it drain on a paper towel. You should have all kinds of brown bits in the bottom. Leave these bits alone. Nothing has burned, I promise. It’s all pure flavor that will make your soup taste more delicious than a plate of gospel chicken on Sunday. 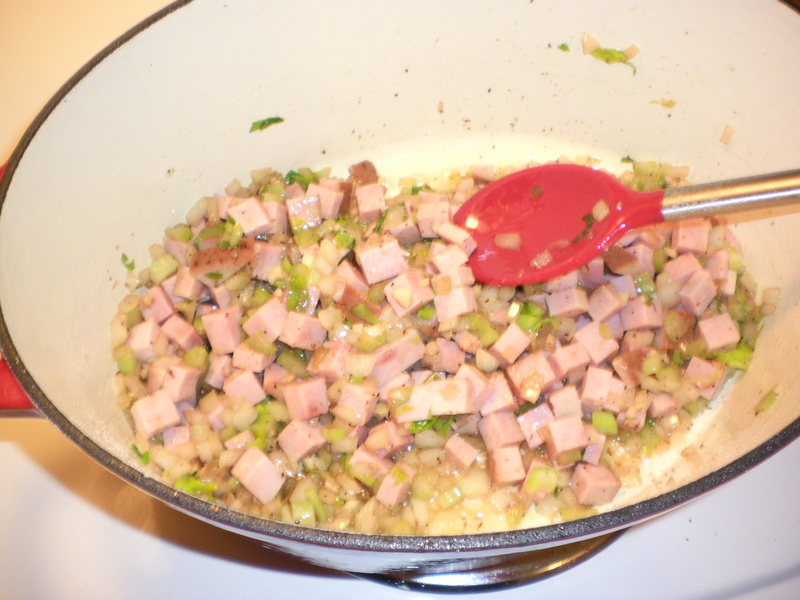 When the bacon is out, add the onion, celery, garlic, and ham. Season with salt and pepper and cook until the veggies are softened. While they are cooking, avoid the urge to eat the crisped pieces of bacon. Give in. Eat a few pieces. Push the pile around so its less noticeable because it will make you feel better. Go ahead and add the beans to the mix and add 4 cups of chicken stock and 4 cups of water. This will add way more flavor than just using water and good heavens, without that ham packet we must do all we can! Turn the heat up on your burner and let the soup bubble away with the lid half on (for the optimists) or half off (for the pessimists) for about an hour and a half. 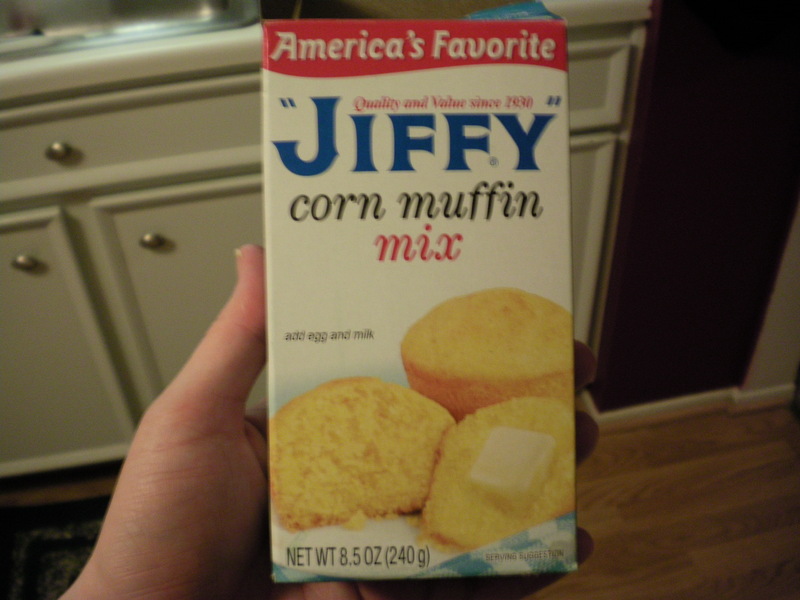 Towards the end of the cooking time, you can make what I like to call “Cheatin’ Kind Cornbread” aka Jiffy Mix. Theres nothing wrong with this cornbread. It’s quite delicious. It’s just that if my grandmother knew I was guilty of such a lazy pleasure, she’d” fix my dog hide”. Then I would have to hastily explain to her that I was out of cornmeal and the roads were too bad for me to navigate them safely and she would finally concede but not without a disapproving grimace. In her honor, I will soon be featuring her famous Southern Skillet Baked Cornbread. Until then, prepare the cheatin’ kind according to the package instructions and destroy the evidence. 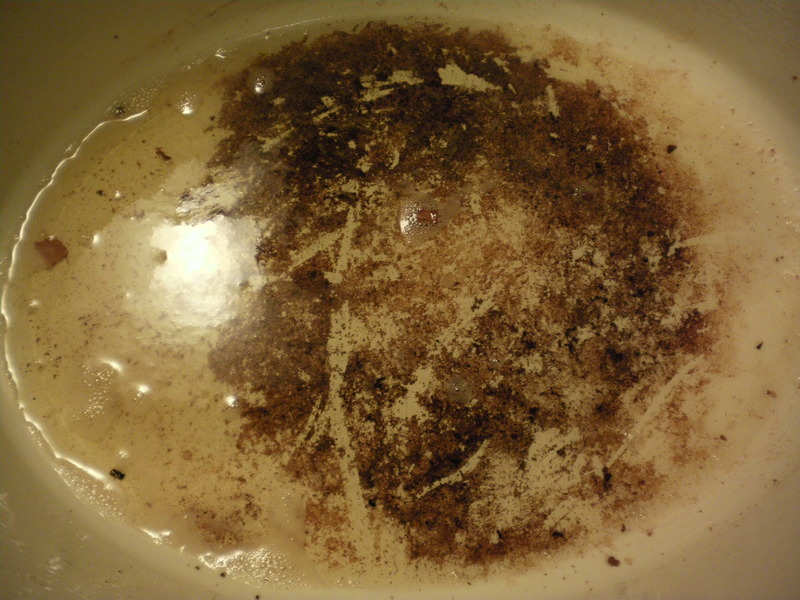 If you check the soup now you’ll notice a lot of the liquid should be gone from the pot. 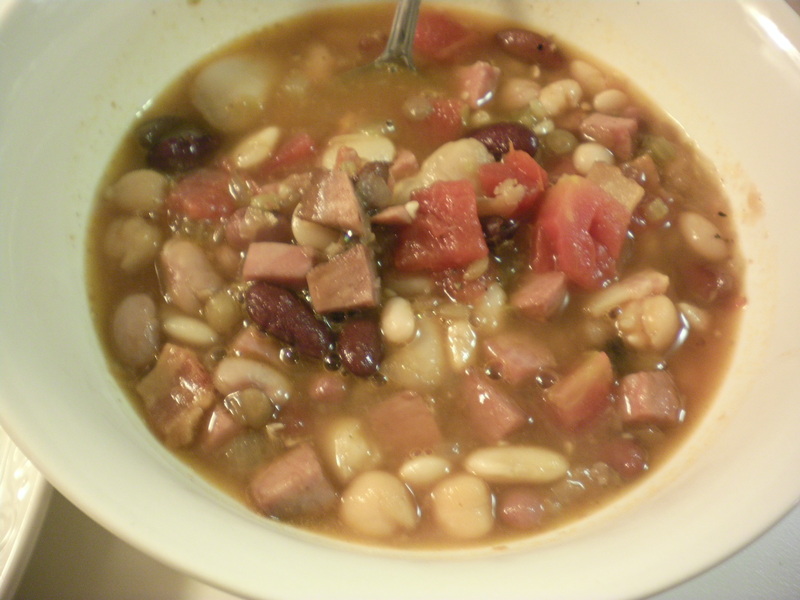 You should have a nice thick soup with very un-crispy beans. Go ahead and add a teaspoon of paprika and chili powder and adjust the salt and pepper as well. If you happen to have any bacon left, add that to the mix as well. You look guilty. Why is that? 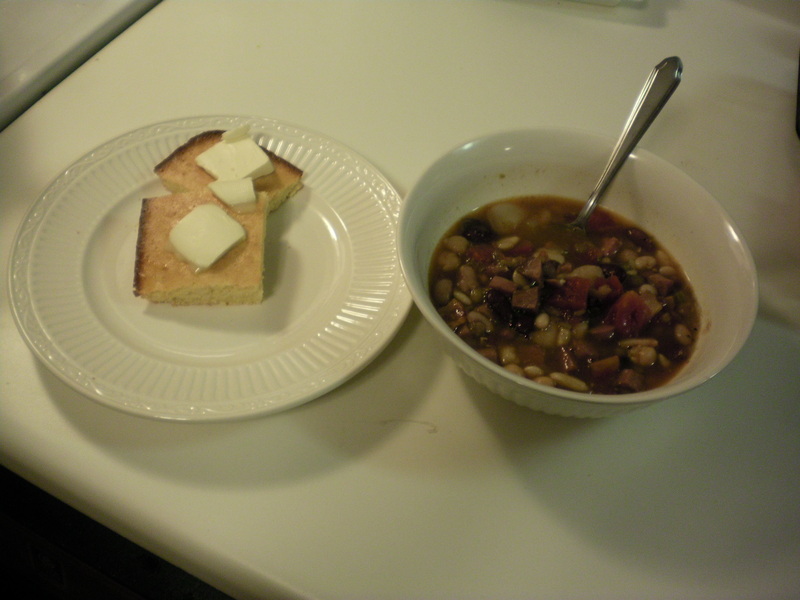 Anyway, serve big bowls of soup with squares of cornbread topped with butter. Yummmmm….